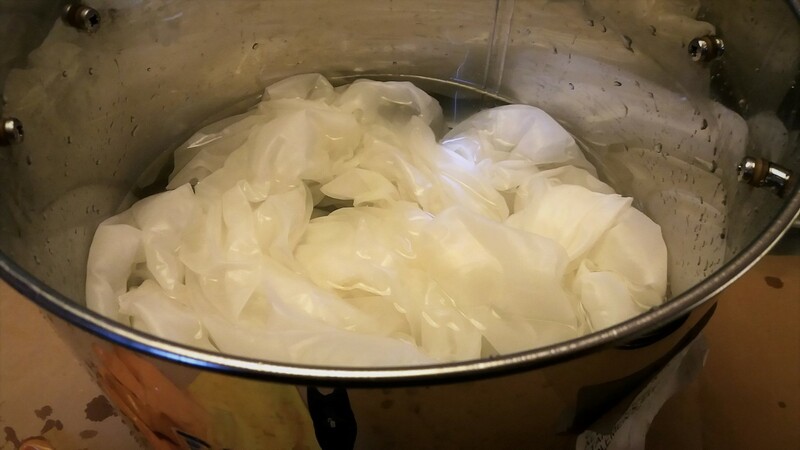 I am just designing and planning on creating a number of naturally plant and flower dyed shibori scarves and thought I would share with you how to prepare wool or silk to take the dye, this process is called mordanting. Mordants are metal salts that prepare the yarn to receive the dye. Different metals produce different colours from the same plant dye stuff. Mordants help to produce strong fast colours from the dye. There are specific mordants for preparing wool and silk and for preparing cotton. 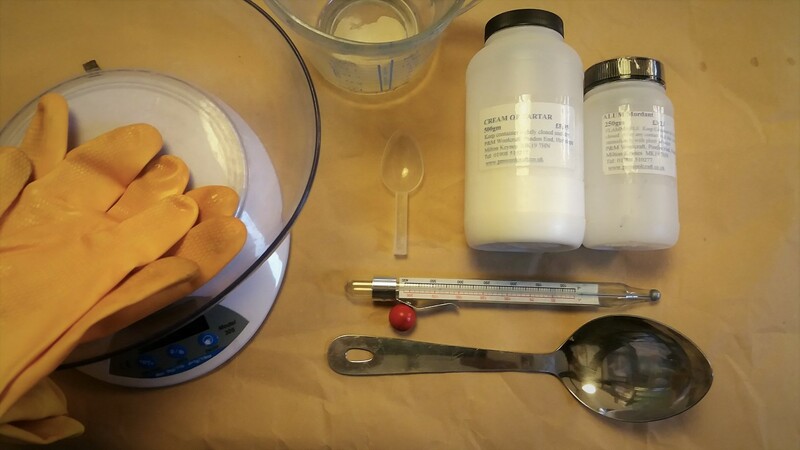 This recipe is for preparing wool or silk for dyeing. All vessels for dyeing need to be stainless steel or enamel. Vessels and all equipment used for dyeing needs to be exclusively used for dyeing. Face mask, even if the ingredients are not toxic it is better to protect the lungs from dust. The most commonly used mordant is Alum: aluminium sulphate for wool and silk. 8% aluminium sulphate to 100g dry weight of wool or silk. 7% cream of tartar to 100g dry weight of wool or silk. If you have 60 gr of fabric multiply 60 x 8 and divide by 100 gives 4.8gr of alum. Do the same kind of calculation for the cream of tartar but multiply by 7. The addition of cream of tartar brightens colours and helps permanently fix the alum to the wool/silk. It increases the amount of alum taken up by the fabric and virtually eliminates any aluminium waste being left at the end of the process. The wool or silk needs to be weighed when dry. The fabric needs to be prepared for dyeing which involves heating it to 60 degrees C or 140 degrees F to remove any dressing or oils. And then soaked for a few hours or overnight before beginning the mordanting process to ensure the mordant is properly taken up. 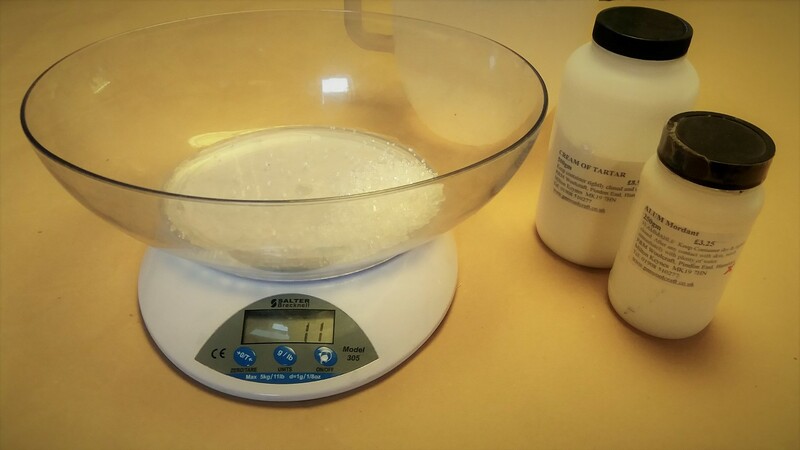 Make up the mordant, by weighing the ingredients carefully. Dissolve the cream of tartar and alum in boiling water in a jug or bowl ready to add to the pan. Fill a pan with cold water. The amount of water needed is also based on how much fabric you have. 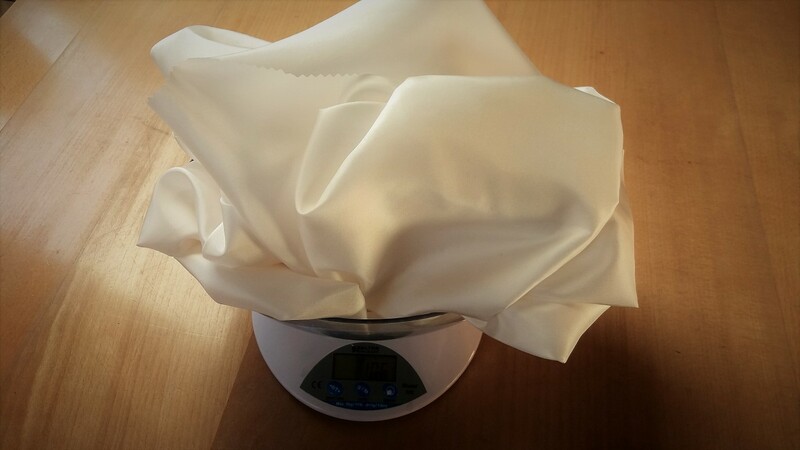 You need room for the fabric to move freely, a good guide is 3 litres (6 pints) of water to 100 gr of fabric. Add the dissolved mordant. Stir well. Add the yarn, bring slowly to the boil (preferably over 45 mins to an hour) and simmer for 45 mins. 180F / 82C do not exceed this temperature. Either leave to cool or rinse well immediately but slowly reducing the temperature of the water so as not to shock the wool or silk. After mordanting, rinse, dry and store the fabric/yarn labelled with note of mordant used. You are all ready to do some natural plant dyeing. 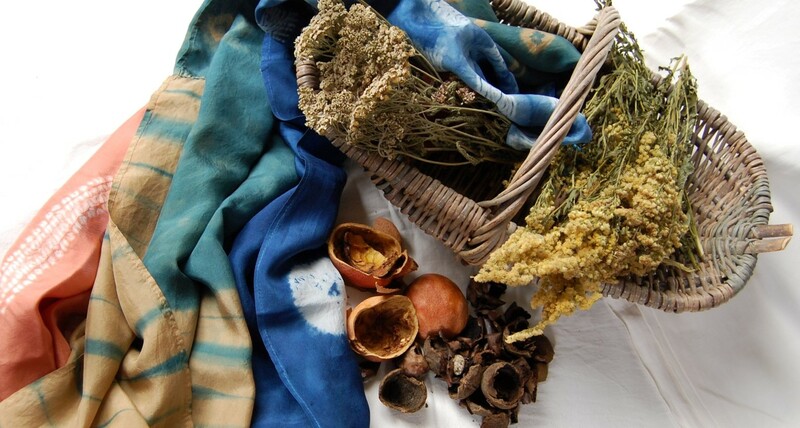 I have shown you how to get your silk or wool fabrics prepared for dyeing with flower and plant material. I hope this is clear and helpful. I suggest mordanting lots of silk or wool in advance. I do this so I have lots of fabric all ready when I feel inspired to do some shibori dyeing with plant dyes.